The Oktoberfest is famous for the millions of jugs of beer that are consumed, for the buxom girls waiting on tables, for the gourmet meals served in the Festhalle (large beer tents), but also for the great Luna Park which every year accompanies the festival of beer. The funfair of the Oktoberfest is always full of attractions, from the most modern and daring, to the most traditional and suitable for children. There is anything, from trains running within ‘mines’, to the houses of mirrors and horrors, the legendary Tagadà, the super roller coaster with several loops. One of the latest attractions at the Oktoberfest’s Luna Park, is ‘The Tower‘, a playground in the park with special attractions like the erupting volcano or the possibility to travel in space in three dimensions. 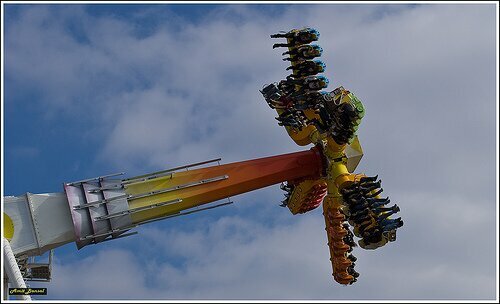 And the ‘Flip Fly‘, only for extreme thrill-seekers, hovering in the air at breakneck speed. Inside the Luna Park there are also many food stalls where to eat the typical Bavarian specialties. The Luna Park is suitable for adults, but children can have lots of fun as well. However, it is advisable to bring them in weekdays and in the morning, when raving mad adults are still not around. Tuesday is the day dedicated to families, with special discounts on many attractions. The Oktoberfest amusement park is closed on the first day of the opening, but then it is open daily from 10 am until midnight.